Cotton thread is made of many tiny fibers, each just 2-3 cm long, yet when spun together the fibers are capable of transmitting tension over indefinitely long distances. From a physics perspective, how threads and yarns transmit tension—making them strong enough to keep clothes from falling apart—is a long-standing puzzle that is not completely understood. In a new paper published in Physical Review Letters entitled "Why Clothes Don't Fall Apart: Tension Transmission in Staple Yarns," physicists Patrick Warren at Unilever R&D Port Sunlight, Robin Ball at the University of Warwick, and Ray Goldstein at the University of Cambridge have investigated yarn tension in the framework of statistical physics. Using techniques from linear programming, they show that the collective friction among fibers creates a locking mechanism, and as long as there is sufficient friction, a random assembly of fibers can in principle transmit an indefinitely large tension. Their results provide a quantitative basis for the heuristic explanation proposed by Galileo in 1638, who was puzzling over the problem of how a rope can be so strong when it is made of such small fibers. "The very act of twisting causes the threads to bind one another in such a way that… when the rope is stretched… the fibers break rather than separate from each other," he wrote. In modern terms, Galileo was describing friction. 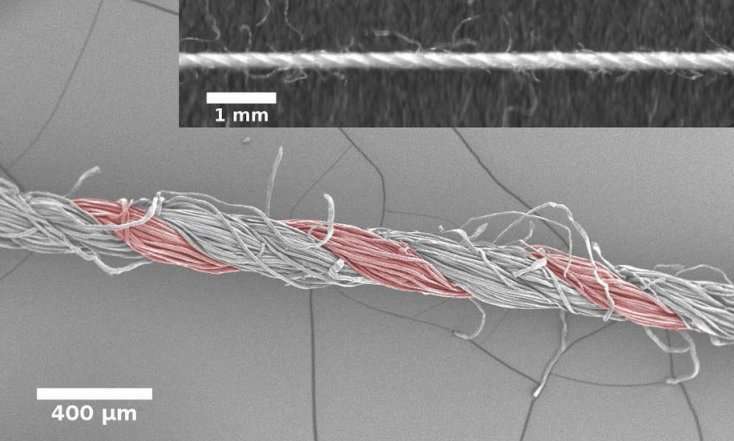 In the new study, the researchers modeled the yarn as a group of randomly overlapping fibers. The results showed that, as the friction increases, a percolation transition emerges. As the researchers explain, this transition corresponds to "a switch from a 'ductile' failure model where the yarn fails by fiber slippage… to a 'brittle' failure mode where the failure mechanism is fiber breakage." Above this threshold, the tensile strength becomes roughly 100 times stronger than before. "We now understand better at a fundamental level how friction stops fibrous materials from falling apart," Goldstein told Phys.org. "From an applied perspective, we can use the insights to underpin the design of fabric conditioners, for example." In the future, the model could also be used to optimize the properties of sewing threads made of various fiber blends. When extended from fibers to granular media, the results may also have applications for better understanding the stress transmission in sand piles and grain silos. In addition, the researchers plan to investigate the threshold in greater depth. "We plan to write a longer paper exploring the nature of the 'supercritical' state, above the percolation transition," Goldstein said.